The Aftermath of Fires, Brings Flooding throughout California…. Five people were killed and at least eight were injured after a heavy band of rain struck around 2:30 a.m. causing “waist-high” mudflows, Eliason said. The mudslide struck a section of the city that is south of the Thomas fire’s burn area and was not subject to a mandatory evacuation, Eliason said. Rescue personnel have yet to even make it north of Highway 192, which is closer to soil scorched by last month’s wildfire. Burned areas are less capable of absorbing water, making the area even more susceptible to flooding and mudslides. Instead, emergency crews spent the first hours of light making rescues in voluntary evacuation zones near Montecito Creek north of U.S. 101. One person was found under the 101 Freeway overpass after they were carried at least half a mile from their home, Eliason said. In the 300 block of Hot Springs Road, crews rescued six people and a dog after four homes were destroyed. The mud lifted one home off its foundation and carried it into trees, where it then collapsed, Eliason said. Firefighters used the jaws of life to cut their way into the home where a firefighter heard muffled cries for help from a 14-year-old girl, Eliason said. The highest preliminary rainfall total appeared to register at roughly five inches in a gauge north of Ojai in Ventura County, in the burn area of the Thomas fire, which forced evacuations and destroyed homes last month, according to the National Weather Service in Los Angeles. With heavy showers still forecast, flash flood warnings remained in affect for Santa Barbara County and southern Ventura County through Tuesday afternoon, according to the NWS. The 101 Freeway was shut down in both directions for more than 30 miles in the Thomas fire burn area because of flooding and debris flow, spanning an area from Santa Barbara to Ventura, according to the California Highway Patrol. Sections of Routes 33 and 150 were also closed in Ventura County, according to the Sheriff’s Department. In Los Angeles , one person was killed when a big rig overturned in the northbound lanes of the 5 Freeway near Los Feliz, said Saul Gomez, public information officer for the California Highway Patrol’s Southern Division. All northbound lanes were closed as of 4 a.m., though Gomez said police were hoping to reopen the roadway by 8 a.m.
Santa Barbara County officials evacuated nearly 7,000 residents from foothill communities shortly before the heaviest surge hit the area, according to Kelly Hoover, a spokeswoman for the Santa Barbara County Sheriff’s Office. But not everyone heeded that call. Around 3 a.m., she said, the storm became ferocious. By 8:30 a.m., the county’s dispatch center had at least 50 calls pending, she said. The U.S. Coast Guard sent rescue helicopters with hoist capabilities into the area on Tuesday morning, she said. 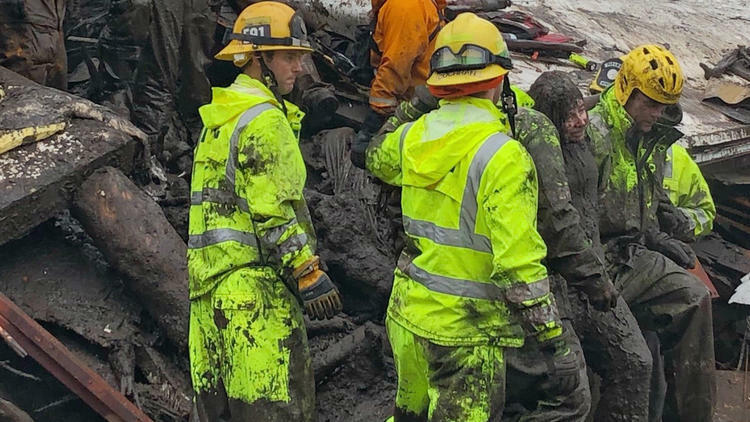 In Los Angeles County, Burbank Police reported “mudslide activity” on Country Club Drive, while surges also washed out the Topanga Canyon Blvd., north of the Pacific Coast Highway. Sections of the 110 Freeway were also closed due to flooding, and the Los Angeles Fire Department had to launch a swift-water rescue to aid a man and a dog trapped in rising water near the Sepulveda Basin Recreation Area. A section of Terminal 2 at Los Angeles International Airport was also flooded and an LAPD cruiser became mired in a debris flow on La Tuna Canyon Road, according to authorities. The officer was uninjured and walked out of the vehicle. The cruiser was in the process of being dug out of the mud with a backhoe early Tuesday. The CHP also said heavy rains likely contributed to a crash that left one person dead on Highway 126 in Ventura County, about 2 miles from the Los Angeles County line, on Monday afternoon. One woman died and two others were injured in the five-car crash, the agency said. The National Weather Service was reporting rainfall totals of up to 4½ inches in Ventura County and 3 inches in Santa Barbara County as of 6 a.m. Nearly 1½ inches of rain had fallen in Bel Air, which could be susceptible to mudslides and debris flow because of damage caused by the Skirball fire last month. Vast swaths of Southern California became subject to evacuation orders Monday as the powerful rainstorm was forecast to release a deluge on areas ravaged by wildfires last month. The heaviest rainfall was expected to hit Tuesday morning. In Los Angeles County, sheriff’s deputies went door to door Monday alerting residents about the orders in Kagel, Lopez and Little Tujunga canyons. Those who refused to leave said they had to sign a form saying they understood the risk. Residents in burn zones in Santa Barbara and Ventura counties, along with an area of Duarte, also were ordered to leave, while those in the Corona and Burbank burn areas were put on notice that they may have to evacuate if conditions worsened. Amber Anderson with the Santa Barbara Incident Management Team said there were about 75 people who called for help for evacuations. They, like Shiach, did not heed the warning to evacuate Monday.